SHAH ALAM, Sept 4 2018 : PKR deputy president Datuk Seri Mohamed Azmin Ali is leaving it to delegates to determine whether he should continue leading the party by looking at his track record serving the party for almost 20 years. Azmin, who is defending his post in the upcoming party elections, said he believed in the wisdom of the delegates who would vote for a leader whom they felt could strengthen unity and take inclusive approach to reform the party. “I am here to retain my current position and have been in the party for 20 years..and they (delegates) know me.. they have seen my track record. I leave my report card for them to evaluate if they decide I should stay and lead the party,” he told reporters on the sidelines of the Selangor state assembly sitting here today. 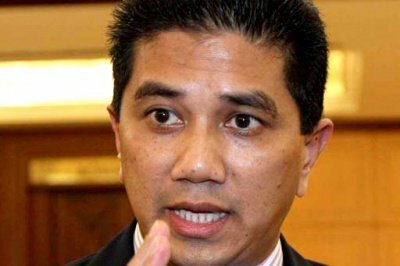 Azmin, who is Economic Affairs Minister and Bukit Antarabangsa assemblyman, will be going up against Rafizi Ramli for the PKR deputy president post in which party elections will run for a period of nine weeks starting this month. On another note, Azmin asked the Attorney-General’s Chambers (AGC) to explain the dropping of graft charges against Finance Minister Lim Guan Eng. “I believe the AGC will explain on the matter so that there is misinterpretation that can spoil the public perception of institutions such as the AGC,” he said. The Penang High Court yesterday acquitted Lim, who is former Penang Chief minister and businesswoman Phang Li Koon on a corruption charge concerning the purchase of a bungalow which was below market value. It was reported that lawyers representing Lim previously submitted a written representation seeking a withdrawal of the charges, which the Attorney-General’s chambers accepted. Prosecutors had sought yesterday for a conditional discharge that would have permitted them to renew the prosecution at a later date.